Boil milk and add sugar and leave on sim for 15 mins. In a cup of cold mild add custard powder and mix well. Then add this custard milk to the boiling milk and again cook for 15 mins on sim then put off the stove. Now leave it to cool down. Soak almonds in water for 3-4 hrs. Then put these almonds in warm water, pull off its skin and cut into small pieces. Also cut pistachio into small pieces. Now peel off skin of apple, pineapple, chikoo,grapes, banana and cut into small pieces. Now add these fruits and dry fruits along with pomegranate in milk. Mix this well. 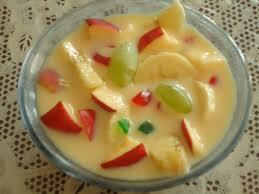 Fruit ka meetha is ready to serve.